Chick Advisor - Free MesmorEyes False Eyelashes! Home » Health & Beauty » Chick Advisor – Free MesmorEyes False Eyelashes! 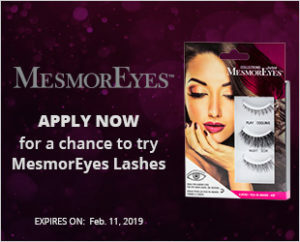 Chick Advisor – Free MesmorEyes False Eyelashes! Chick Advisor is looking for Canadian women to try MesmorEyes False Lash kits for themselves (complete with MesmorEyes lash glue). MesmorEyes Lashes are specifically designed to complement and emphasize your unique eye shape by identifying the lash lengths most appropriate for each of the most common eye shapes. Each premium quality set is hand-knotted and feathered from 100% sterilized human hair, or synthetic hair, for the most natural look. Night (a more dramatic look, great for a girls’ night out). Sign up before February 11, 2019.